Shares of General Electric (NYSE: GE) hit a 52-week high recently. Let’s take a look at how it got there and see if clear skies are still in the forecast. In an environment where earnings growth is like squeezing blood out of a turnip, General Electric’s second-quarter earnings report and steady guidance are enough to propel it to a new 52-week high. For the recently ended quarter, GE reported its ninth straight quarter of operating earnings growth as industrial segment revenue grew 9%, organic growth leapt 10%, pricing ticked slightly higher, it unveiled a plan to split its energy infrastructure division into three new segments, and, most importantly, earnings at GE capital continued to improve as Tier 1 capital increased to a healthier 10.1%. If you recall, GE’s share price was sacked during the credit crisis due to poor-quality loans. Since then, it has purposefully shrunk its loan portfolio (revenue fell 8% this quarter for GE Capital) in order to rid itself of non-performing assets. But it’s not all fun and games for GE. For one, foreign currency fluctuations are hurting all U.S. companies that sell internationally. GE rival United Technologies (NYSE: UTX) estimated that currency movements hurt its second-quarter results by up to US$800 million, helping sales to decline by nearly 5%. Also, GE Capital isn’t out of the woods yet. Much like Citigroup (NYSE: C), which recently boosted its common Tier 1 capital ratio to 12.7%, GE Capital is focused on cash generation at the expense of revenue growth, which could have a negative impact on both companies’ bottom lines for years to come. 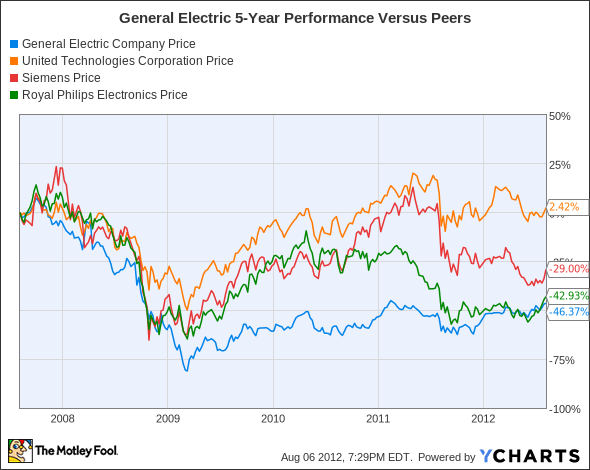 Let’s see how General Electric compares to its peers. As you can see, the industrial goods sector was hammered by the recession. Only United Technologies is higher in this group, with Siemens (NYSE: SI) and Koninklijke Philips Electronics (NYSE: PHG) (say that three times fast) still outperforming GE thanks to the dismal performance of its finance unit. Normally we get some differentiation when we look at financial metrics, but we aren’t getting much help here at all. All four companies boast fantastic yields, are trading within a stone’s throw of one another in terms of forward P/E and cash flow, and are reasonably priced given macroeconomic uncertainty. Another factor all four share in common is negative currency and sales implications due to Europe’s debt crisis. In GE’s latest quarter, foreign currency translation provided a negative US$900 million effect on revenue, while United Technologies lost nearly US$800 million in sales due to a weaker euro. Siemens, which relies on the eurozone for the vast majority of its sales, saw orders tumble 23% in its most recently ended quarter. Philips Electronics was the lone bright spot, literally, as energy-efficient light bulb sales boosted results past Wall Street’s expectations. However, its CEO, Frans van Houten, warned that visibility remains very poor. Now for the $64,000 question: What’s next for General Electric? That question depends on the health of the overall economy, its ability to strengthen the capital position and loan portfolio of its GE Capital arm, and if it can maintain strong pricing power. General Electric was once a great company that seemed infallible, but as we humbly learned, that’s just not the case with any stock. GE has, though, made solid efforts to clean up GE Capital’s portfolio, has stuck to its guns about double-digit EPS growth in 2012, and has shown strong industrial growth in the face of a very weak global growth and pricing environment. Although it’s no longer a dividend aristocrat, GE’s dividend should begin making noise once again now that it’s on the rise and yielding more than 3%. For the long run, I feel GE has once again become a go-to company to own.